On your dad’s birthday, give him a warm birthday message that he will cherish forever. Make him smile or let him know how much he means to you. 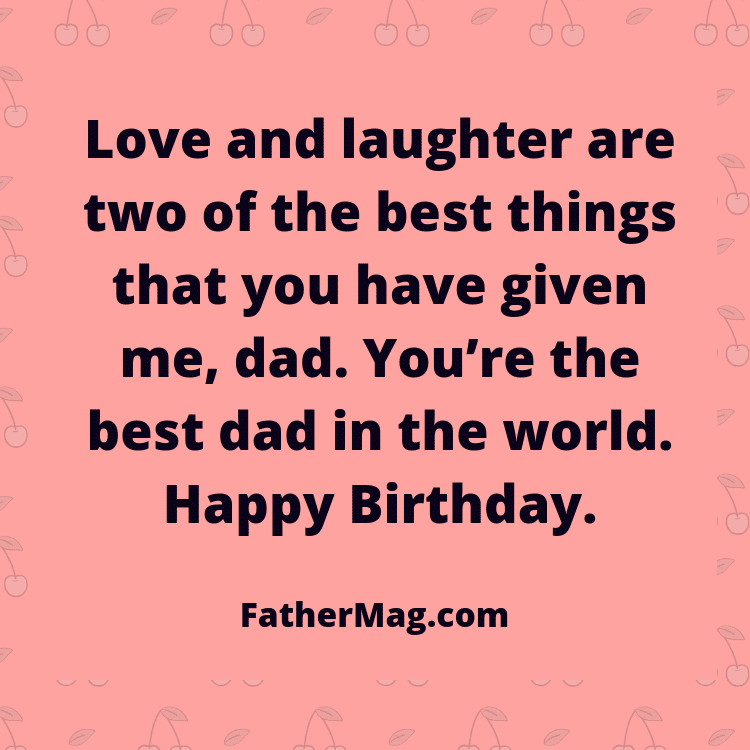 If you need an idea, here is a list of dad birthday quotes we compiled. We hope you find the perfect and the most heartwarming birthday wishes from this list to give to your dad! 1. You were the one who always told me that I can do the impossible if only I try hard enough, that alone is the reason I am here, happy birthday dad! 2. All I wish for you is that we get to spend more time together, that I can have more bonding time with you and that you keep smiling your happy smile, enjoy your day. 3. Happy birthday to you, dad, just know that I love you and that I would not know where I am right now if you are not there for me to guide me through it all. 4. You helped make me who I am! Happy Birthday, Dad. 5. Any man can be a father. It takes a special man to be a dad. Happy birthday to the World’s Best Dad! 6. 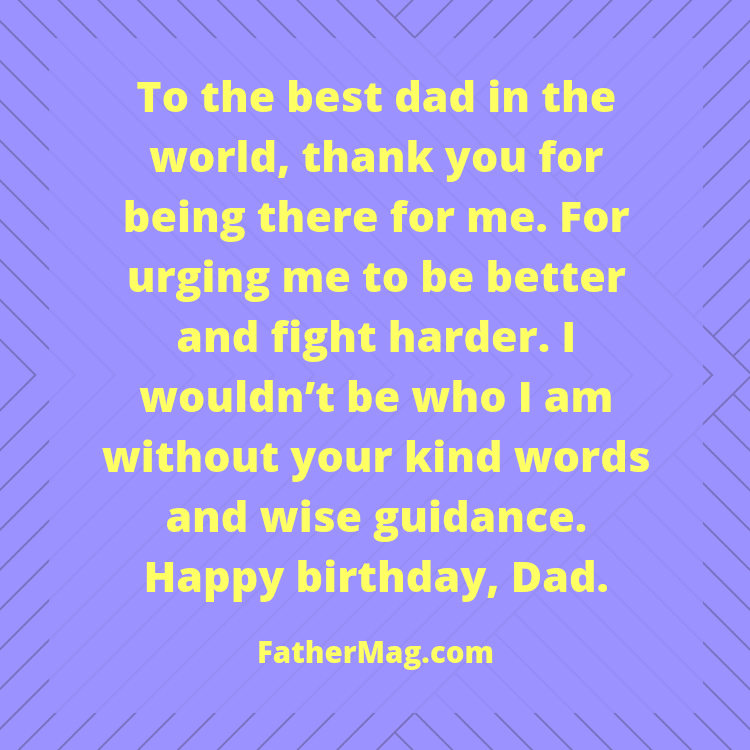 Every awesome dad deserves to have an amazing birthday, and more. Happy birthday, father. 7. Growing up, I always admired your awards. Today, I have to say that you deserve the Best Dad in the World award for all that U do. Have a happy birthday, Dad. You deserve the best. 8. From helping me up when I fell to taking me out for practice after I missed the winning goal, you’ve taught me to never give up. I owe my success in life to U, and can’t wait to take you out for your birthday. happy bday dad. 9. I know I wasn’t always the perfect child, but you have always been the perfect dad. Thanks for fixing the little things I break and for showing me how to correct my own mistakes as I grew. Enjoy your birthday today. I love you. 10. I always wanted to grow up to be just like you, and I still haven’t changed my mind. You are my perfect example of strength and love, and I aspire to be the same type of dad to my kids that you have always been for me. Happy birthday. 11. To the best dad in the world, thank you for being there for me. For urging me to be better and fight harder. I wouldn’t be who I am without your kind words and wise guidance. Happy birthday, Dad. 12. Happy birthday to the man who taught me everything I know. I am so honored to share in your wisdom. I love you. 13. They say that we learn from the ones who love us most. I am thankful to have been loved by you, for U have helped me to become the person I am today. Happy birthday, Dad. 14. 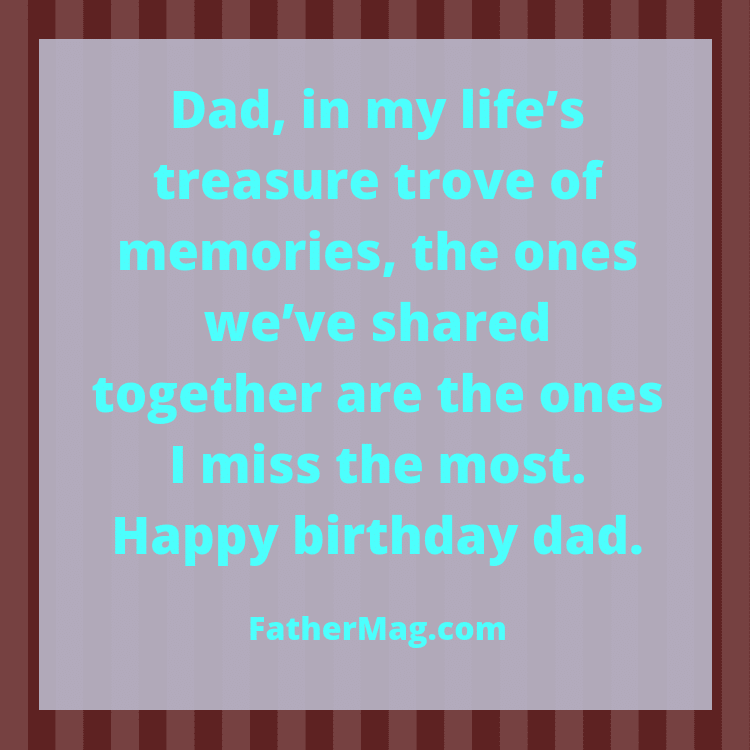 Dad, in my life’s treasure trove of memories, the ones we’ve shared together are the ones I miss the most. Happy birthday, dad. 15. Dad, like the shade of a tree, you’re my life’s canopy. Happy birthday. 16. Today is the right time for me to say, how grateful I am to you for always showing me the way. Happy birthday, dad. 17. People rub lamps to find genies while I simply call out my dad’s name. Happy birthday, daddy. 18. Dear Dad, on your birthday, I want you to know that you are truly an inspiration, a friend and a teacher to all of us. 19. I love how you know the things I like and what I dislike most, you know me better than I know myself and that is indeed saying something, enjoy your day, dad. 20. On your birthday, let us go to somewhere far away, travel together and just have some child and parent time, I miss being with you already. 21. Dear dad, on your birthday, I want you to know that you are truly an inspiration, a friend and a teacher to all of us. 22. Dear dad, thank you for showing me how great the world is. I may need quite a lot of tips from you as I go on and face the challenges in life, so thank you in advance. Happy Birthday. 23. I am lucky that I was given the best father in the world, a father who truly loves me with all of his heart. Best Birthday to you, dad. 24. Love and laughter are two of the best things that you have given me, dad. Thanks, dad. 25. Happy Birthday, Papa. Loving wishes for the most amazing Dad in the world. Stay fantastic. 26. Dear dad, thank you for always being there for us without getting in the way of the decisions we make in life. May you have many more birthdays to come, happy birthday daddy. 27. Best Birthday to the most wonderful Dad, who is hotter than the lighted candles shining brightly on his cake. I love you, Daddy! 28. Dad, you are truly out of this world and yet, you are the most amazing dad on the planet. That may sound weird, but anyways, happiest birthday! 29. Daddy, your unconditional love has helped me to feel safe, warm and secure. Thank you for everything, daddy. 30. From my heart to yours, dad, you will always remain special to me. I love you and Happy Birthday! 31. Happiest Birthday to perfect dad. Dear daddy, your love has given me the ability to truly believe in myself. Thank you for the support and the guidance. 32. Dear dad, I hope you know how much you really mean to me. Thank you so much for everything, Happiest Birthday. 33. Happy birthday, daddy. Daddy, thank you for all the guidance and the support you have given me all throughout these years. You certainly made life so much easier for me to live. 34. I wonder if you know how much I love you, daddy. I may not tell you enough, but I do love you with all my heart, to infinity and beyond. Have a great birthday. 35. 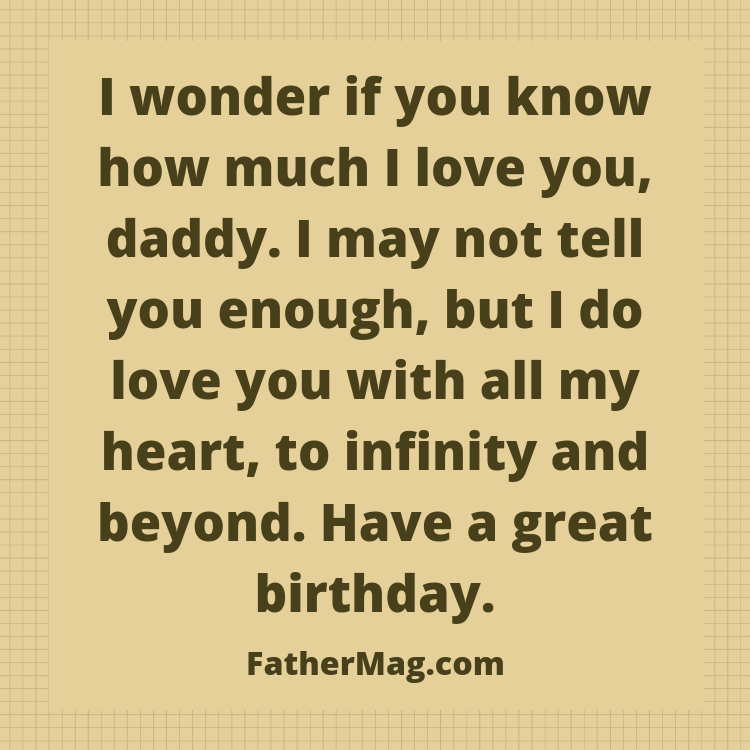 Daddy, I hope that you will feel great on this Birthday of yours. May next year and the upcoming years of your life will be filled with more happiness, love, and peace. 36. Although a lot of people say that I got my good looks from you, I still feel that you look way better than me, daddy. Have a great birthday. 37. It makes me feel really proud to have you as my dad. I love you and may you have many more birthdays to come. 38. Great fathers are the ones who guide their children, but still, let them make their own decisions and learn from their mistakes. Happy birthday to the wisest man I know. 39. The best scotch is aged scotch. I didn’t get you aged scotch, it’s just a metaphor, and way too expensive. Should I have gotten you scotch? Maybe one of those airplane bottles. Oh yeah, I almost forgot, happy birthday. 40. I know I don’t say it often, but I really do appreciate all the sacrifices and hard work you put into raising me. Happy birthday, dad, I love you. 41. Happy birthday to the man I respect and love more than any other. 42. Real heroes don’t wear capes, they make bad puns. Thank you for being a real hero dad. Happy birthday. 43. Have you ever noticed that the worse a dad’s jokes are, the better father they are? Well now at least we know why your dad jokes are so terrible. I hope your birthday is much better than your jokes. 44. Every birthday you have means another year you made our lives special. Thank you, dad. 45. I can’t wait to celebrate your birthday this weekend. There will be good food, good company, good laughs, and it’s all for you pops. 46. Happy birthday to the hardest working man I know. I’m so proud that you are my dad. 47. I know, whatever happens, I can always count on you dad. Happy birthday to the most reliable dad around! 48. Another year older and another year wiser. You’ve helped guide me throughout my life with some great advice. I hope you’ll continue to help me navigate the choppy waters of life. 49. 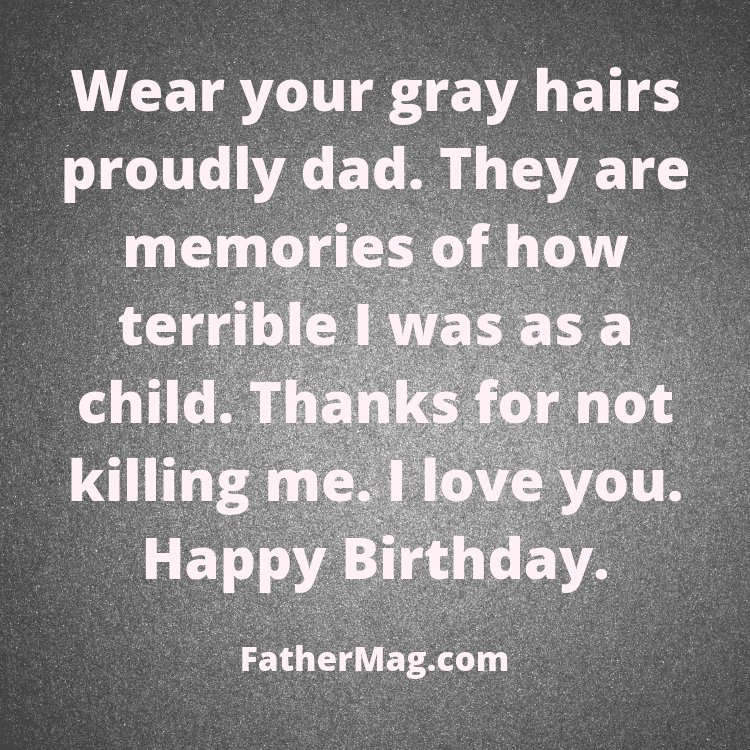 Wear your gray hairs proudly dad. They are memories of how terrible I was as a child. Thanks for not killing me. I love you. Happy Birthday. 50. It’s not easy being a father, but you do it with class and style. Happy birthday to the dad who can do it all. 51. Candles. Cake. Ice cream. Presents. Dad. Birthday. Can you tell I’m excited for your birthday? 52. Happy birthday to the man who fought all the monsters under the bed and in the closet. Thank you for always making me feel safe. 53. Dad, you are just like a busy student. You’ve got a lot of class. Happy birthday. 54. We wanted to get you a cake with a candle for every year, but the fire department said it would be a fire hazard. Oh well, happy birthday anyway. 55. I wish I could be there to wish you a happy birthday in person, but just know that you are in my heart and I’m thinking about you on your special day. Happy birthday, dad, can’t wait to see you again. 56. I haven’t always been the best kid, but that didn’t stop you from being the best father. Happy birthday, dad. 57. I tried to think of something beautifully poetic to write for your birthday. But instead, I thought I would just give it to you straight. Thank you dad; for everything you have done for me. You are just the best kind of person. The world would be a better place if there were more people like you in it. 58. We can’t choose who our father is, but if I had a choice I would still choose you. Happy birthday to the king of dads. 59. Getting older is hard, but you do it with style. 60. You can always seem to make me crack a smile even when I’m at my lowest. Thank you for bringing so much laughter into the world. 61. Happy birthday, daddy, I hope you get everything you want on your special day. 62. So, I got you a present. But my real gift is in this card. Here it is: Go type Reddit dad jokes in Google. You can thank me later. Happy birthday, dad. 63. Growing up, I always admired your awards. Today, I have to say that you deserve the Best Dad in the World award for all that you do. Have a happy birthday, Dad. You deserve the best. 64. From helping me up when I fell to taking me out for practice after I missed the winning goal, you’ve taught me to never give up. I owe my success in life to you, and can’t wait to take you out for your birthday. 65. You showed me what true love really means, dad. Thank you for always reminding me to love myself first. I cannot wait to celebrate your birthday. 66. I always wanted to grow up to be just like you, and I still haven’t changed my mind. You are my perfect example of strength and love, and I aspire to be the same type of dad to my kids that you have always been for me. Happy birthday. 67. You were the one who always told me that I can do the impossible if only I tried hard enough, that alone is the reason I am here, happy birthday dad. 68. All I wish for you is that we get to spend more time together, that I can have more bonding time with you and that you keep smiling your happy smile, enjoy your day. 69. Dad in my life’s treasure trove of memories, the ones we’ve shared together are the ones I miss the most. Happy birthday, dad. 70. Dad like the shade of a tree, you’re my life’s canopy. Happy birthday. 71. Today is the right time for me to say, how grateful I am to you for always showing me the way. Happy birthday, dad. 72. People rub lamps to find genies while I simply call out my dad’s name. Happy birthday, daddy. 73. To the best dad in the world: thank you for being there for me, and for urging me to be better and fight harder. I wouldn’t be who I am without your kind words and wise guidance. Happy Birthday, Dad. 74. Growing up, I used to admire all the trophies on your shelf. Today, I think you deserve the Best Dad in the World trophy. Enjoy your birthday. 75. Happy Birthday to the man who has taught me everything I know. I am so honored to share in your wisdom. I love you. 76. They say that we learn from the ones who love us most. I am thankful to have been loved by you, for you have helped me to become the person I am today. Happy Birthday, Dad. 77. They say that wisdom comes with age. 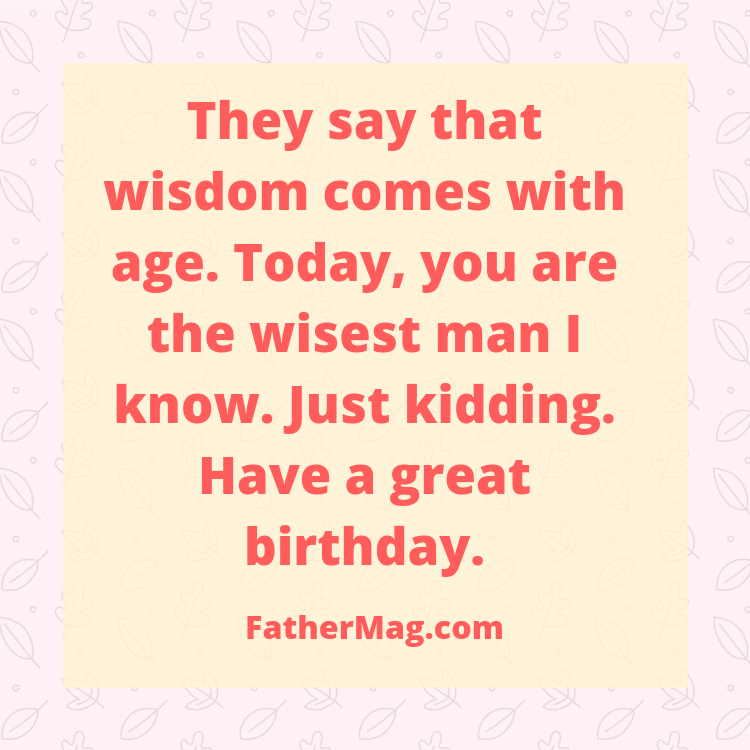 Today, you are the wisest man I know. Just kidding. Have a great birthday. 78. Dad, you were there for me from the day I was born, always having my best interests in mind. You are one of the most important people in my life and I love U with my whole heart. Happy birthday, Dad. 79. I’d like to use this day as an opportunity to tell you how much I adore you, and how great of a father you’ve been throughout all these years. Happy birthday, dad. 80. As I was growing up, I remember myself always looking up to you, always admiring you, always having you as my role model. And judging by the person I am today, you’ve been a great role model dad! Happy birthday! Thank you for everything, I love you. 81. Happy birthday to you, dad, just know that I love you and that I would not know where I am right now if you are not there for me to guide me through it all. 82. You were the one who stood by my side even when you knew I was wrong and let me tell you just how much I appreciated that, happy birthday. 83. I love how you know the things I like and what I dislike most, you know me better than I know myself and that is indeed saying something, enjoy your day, dad. 84. On your birthday, let us go to somewhere far away, travel together and just have some child and parent time, I miss being with you already. 85. I could never find a gift that would measure to the love you have showered me in. 86. Happy birthday to the best father ever. I remember when you cleaned up my skinned knees, held my hand across the street, taught me how to reach for the stars. You are my inspiration and my hero. 87. Your soul is pure, your heart is priceless, and your wisdom is astounding. Happy birthday, Dad. 88. Dear dad, thank you for showing me how great the world is. I may need quite a lot of tips from you as I go on and face the challenges in life, so thank you in advance. Happy Birthday. 89. I am lucky that I was given the best father in the world, a father who truly loves me with all of his heart. Best Birthday to you, dad. 90. Love and laughter are two of the best things that you have given me, dad. You’re the best dad in the world. Happy Birthday. 91. Happiest Birthday Papa. Dear daddy, on this special day of yours I want to take the opportunity to thank you for everything that you have done for me. You are absolutely the most amazing daddy in this world. 92. I know I wasn’t always the perfect child, but you have always been the perfect dad. Thanks for fixing the little things I broke and for showing me how to correct my own mistakes as I grew. Enjoy your birthday today. I love you. 93. If there’s one good thing about having children so young like you did, it’s that there’s so much less of a gap when it comes to our culture and understanding. For that reason, we got you a digital present. All you have to do is go to the play store, install Dropbox, download the voucher, find the pickup on Google maps and self-checkout with your touchless card. Happy Birthday, Dad. And Good luck. 94. Another year older and another year wiser. You’ve helped guide me throughout my life with some great advice. I hope you’ll continue to help me navigate the choppy waters of life. 95. To the best dad in the world: thank you for being there for me, and for urging me to be better and fight harder. I wouldn’t be who I am without your kind words and wise guidance. Happy Birthday, Dad. 96. Dad, you’re one in a million. No, one in a billion. Actually, one in a trillion. In other words, you’re one of a kind. The best, most loving kind. Happy birthday. 97. I‘m so proud to have such a great father like you and I will always cherish all the priceless lessons that you have given me! Have a wonderful birthday, dad. 98. I wish I could be there to wish you a happy birthday in person, but I’m thinking about you and I will see you soon. 99. Thank you, dad, for always treating me like the most special person in the world. Thanks for being there for me when I needed you the most and I hope that this next year of your life will bring you lots of joy and happiness. 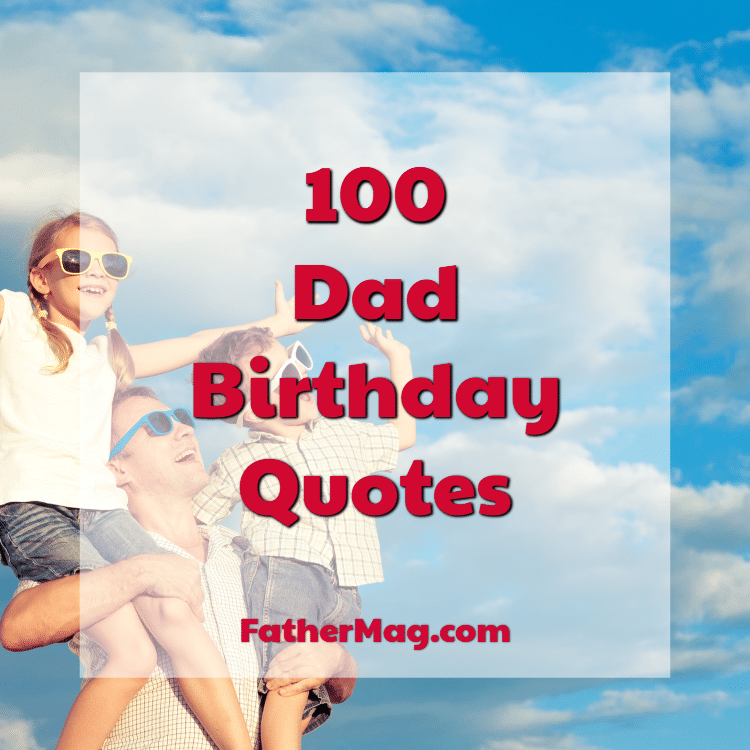 Read also: 100 Father’s Day Quotes for Husbands. 100. Dad, you certainly have made me to become the best person that I am today, Thank you. You truly are the best father in the world and I look up to you for everything. I love you! Happiest Birthday. 101. You were there when I first learned to walk, ride a bike, drive a car and on my first plane flight, it’s all thanks to you that I’ve seen the world, dad, I just wish I could have brought you with me. Maybe on my next adventure, I will! Happy Birthday. 102. I tried to think of something beautifully poetic to write for your birthday. But instead, I thought I would just give it to you straight. Thank you, dad; for everything you have done for me. You are just the best kind of person. The world would be a better place if there were more people like you in it. 103. Dad, having someone like you in my life is a privilege denied to many. May no dream of yours fail to materialize. I love you more than all the positive words in the dictionary can ever express. Happy birthday. 104. I feel sorry for sons who aren’t blessed with a father like you. Dad, thanks for being my biggest blessing in life. May your heart never long for happiness. Happy birthday. 105. You gave me the greatest gift in the world by loving me unconditionally and making me believe in myself. With every day that goes by, the stronger I believe that you were sent from Heaven to make my life on earth paradise. Happy birthday. 106. Dad, just like you have made my happiness your number one priority all your life, so shall I also make yours my most important priority. May the Heavens reward you beyond measure every day of your life. Happy birthday. 107. Dad, my gratitude for all the love that you have shown me over the years is immeasurable. God bless your new age. Happy birthday. 108. A loving father like you deserves to have nothing but all the happiness and beauty in this world. May God bless your beautiful heart and soul with happiness all the days of your life. Happy birthday. 109. Dad, how can I ever thank you for forming me into the responsible man that I am today? How can I ever repay you for that? I guess even if I were to leave up to a thousand years, I could never repay you for all your teachings, advice, love and care. God bless you. Happy birthday.